The number of students appearing for NEET exam is increasing every year. Aspirants desiring to fulfil the dreams of becoming doctor need to make a right strategy to be ahead in the competition. This year the exam is scheduled on 5 May, 2019, and time is knocking at the door. The level of nervousness is increasing, so there is the need for a refined strategy on how to score 600+ in NEET exam. To make the task of securing marks easier and enhancing the process of preparation, here are the basic techniques & tips for NEET 2019, you need to take into. This has got enough capacity to transform your potential into performance. It would not only help you to crack the exam, but help you fetch marks above 600. Here are the step by step instructions. Notes are very important to remember the important points and present answer systematically in the exams. A proper outlining of the notes gives better understanding. For the purpose of fostering systematized presentation of concepts, we have prepared the right way to keep notes in the chapters. More so, it is help for the last-minute revision for the exam. Get the NEET concepts notes with us. Mock test helps to locate the areas of difficulty and also you will be able to have an understanding of the types of questions asked in the examination. This helps you to acquire the most essential qualities of time management, speed with accuracy. Mock test is the best way to know and cover the entire syllabus. Give yourself to free mock test for NEET 2019 with us and increase the efficiency in securing higher than 600 marks. Attending in mock test also gives an analysis of the performance in view of the exams. The previous year’s questions papers are a great help to understand the exam. It is the most vital part of the exam preparation. It helps you to get an overview of the exam, and its question pattern, the level of difficulty and finding its importance. Give a new boost into your preparation with NEET solved papers. Too often we load our desk and our mind with a great collection of irrelevant study materials. The best way is to make right choice in getting the helpful materials and begin in earnest for the preparation. To make your work easier, here are some the most helpful and easy materials prepared by experts in the field. You can profit immensely from NEET study materials 2019. You can also find a list of other relevant free downloads study material for NEET pdf. Apply these step by step guides into your preparation and see the difference. 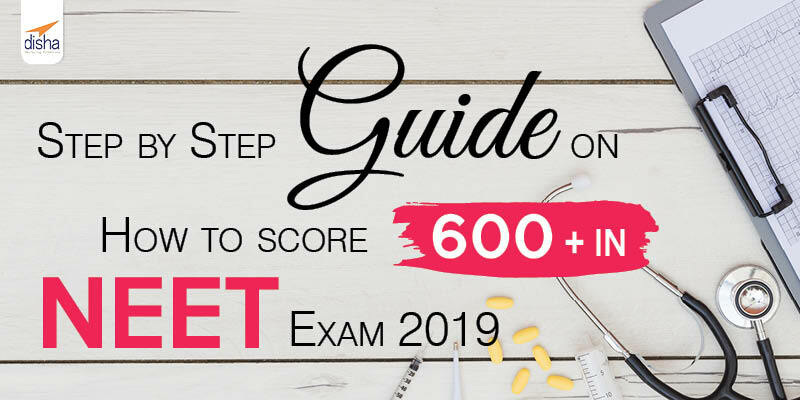 These guide on how to score 600+ in NEET exam, is a sure guarantee to realize your dreams. Flame your zeal and ambition with these tips and be the beneficiaries.